All the photos from this trip can be found here. Some trips you just can't win (or so it seems). I had been invited to Baton Rouge, Louisiana, to give a banquet program to the Southeast Louisiana Chapter of the National Railway Historical Society on Saturday, February 19. Subsequent to that, my friend and former boss Jim Boyd passed away and a memorial service was scheduled for February 26 in his hometown of Dixon, Illinois. A drive to Baton Rouge and back followed by an immediate turnaround to drive to Dixon was going to be tough, but combining the trips into one big triangle would save 700 miles -- and as an added bonus I could hit some great railroading along the Mississippi in Memphis and St. Louis. So, a triangle trip it would be! My brother Bruce and I left New Jersey on Thursday evening, February 17, and got as far as Staunton, Virginia. Next morning we hit the road again and by the time we got to Chattanooga it became apparent we'd have a few hours in the schedule to take a break. Unfortunately, clouds were prevalent this day. 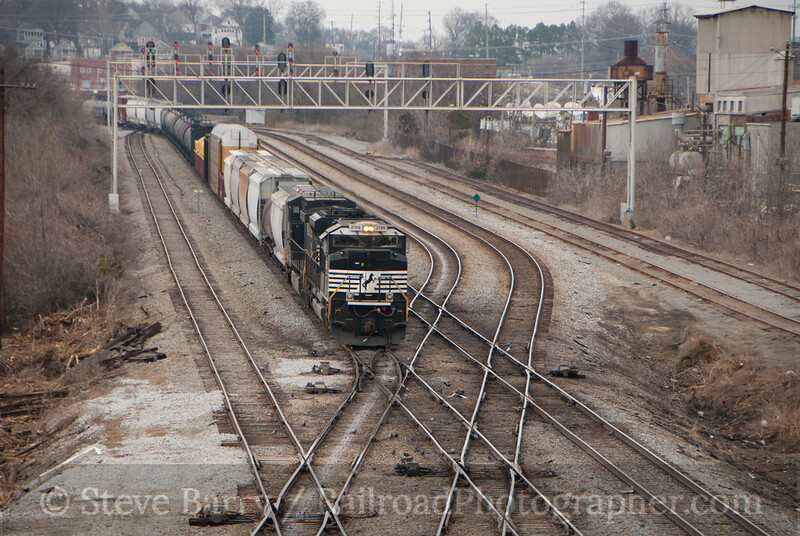 We did get a train going through the complex junction at 16th Street in Chattanooga (above) and chased a few trains over the mountain towards Alabama, and soon we were heading south again, finally tying up in Meridian, Mississippi. Next morning we finished the drive to Hammond, Louisiana (the actual location of the banquet) and after the banquet we went to the Hammond station to see the northbound City of New Orleans pause at the station. 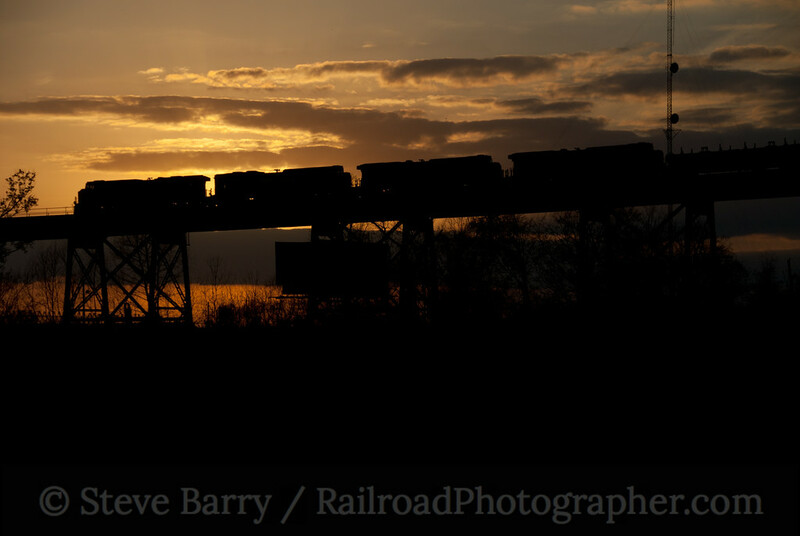 We then headed into New Orleans where we got a few trains on the 22,996-foot-long Huey P. Long Bridge over the Mississippi, including a sunset shot. We had some sun the next morning as we watched the northbound Crescent cross Lake Ponchartrain into Slidell, and wound up spending most of the rest of the day dodging clouds. We did another couple of trains on the Huey P. Long Bridge from the west end of the span in Bridge City. We wanted a shot at the east end of the bridge, but trains did not cooperate. 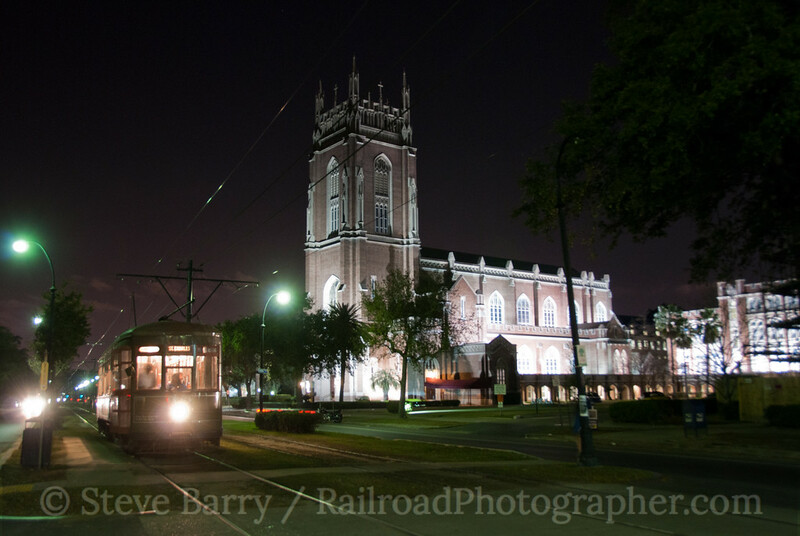 That night we began our exploration of the famous New Orleans streetcar system. We took a few night shots here and there, with our favorite location being at Loyola University. We also tried shooting downtown near the Ponchartrain Hotel. 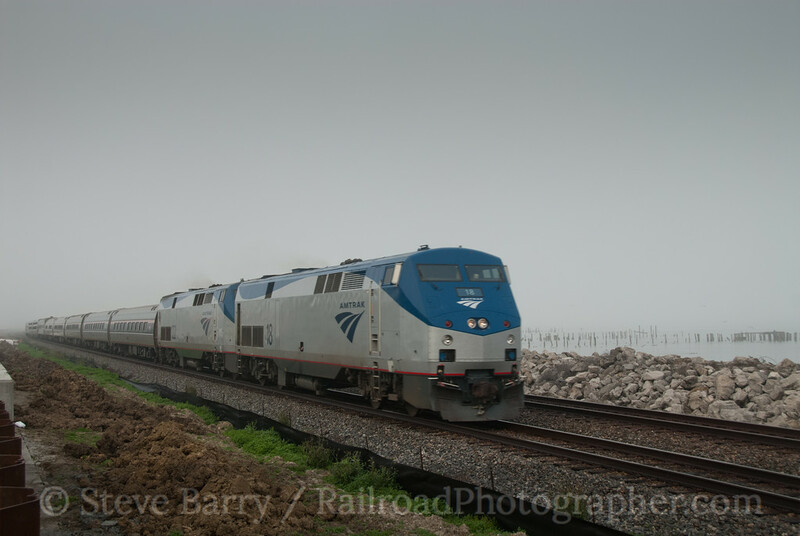 Monday would be another day in the Big Easy, but we found ourselves fighting clouds in the wrong place and trains not showing up when we needed them. We started by catching the northbound Crescent from the levee along Lake Ponchartrain, but morning fog prevented us from getting as good of a shot as we wanted. We then headed over to Canal Street to get the red streetcars -- on our 2008 visit to New Orleans the red cars were not running as they had been damaged by flood waters from Hurricane Katrina. The sun peeked in and out, but the nice thing about streetcars is there is always another one coming. It didn't take long to get a few nice shots on Canal Street. We then headed over to the St. Charles line to get some of the historic green cars. 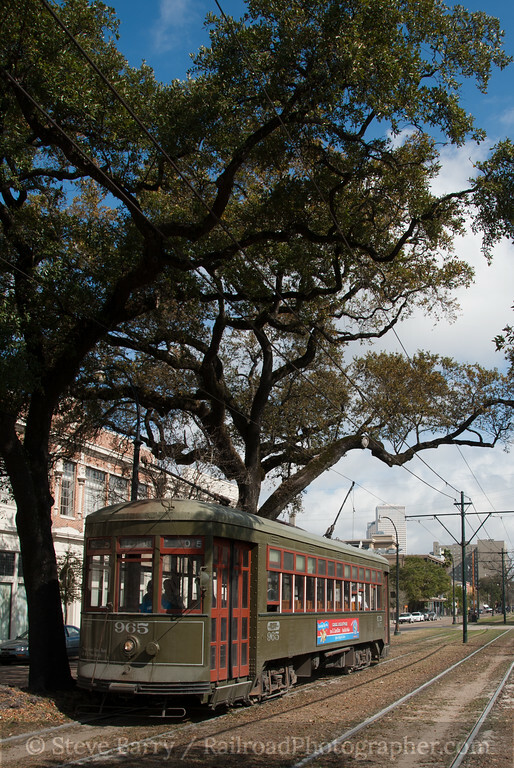 The streetcar lines in New Orleans are photographically target-rich, and we found a couple of nice locations to shoot the cars. The location seen at left also had a convenient Burger King where we could grab a snack. 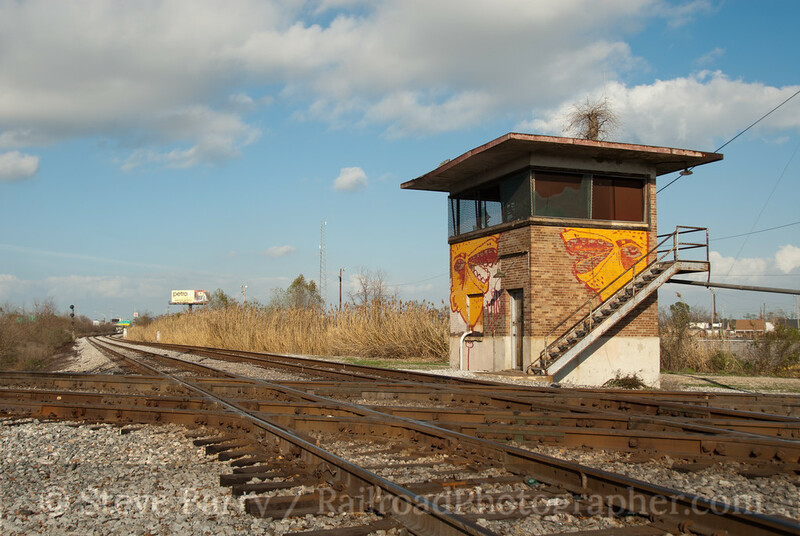 Also on our list for the day were several other shots on the freight railroads, including the east end of the Huey P. Long Bridge, East Bridge Tower, NE Tower and other locations. We had spent part of the morning at NE Tower but got no trains. 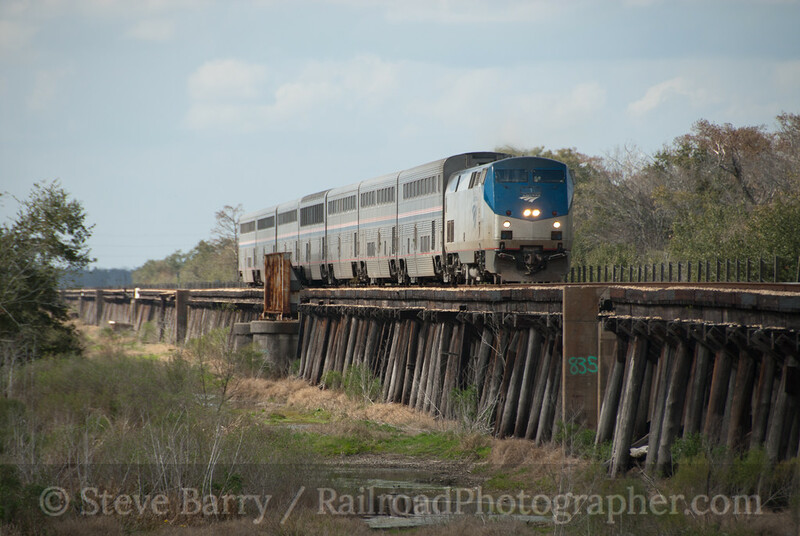 And during our entire stay in New Orleans we never did see an eastbound train on the bridge at the right time. As I said before, this was our second trip to New Orleans. There is a blog entry about the first one here. 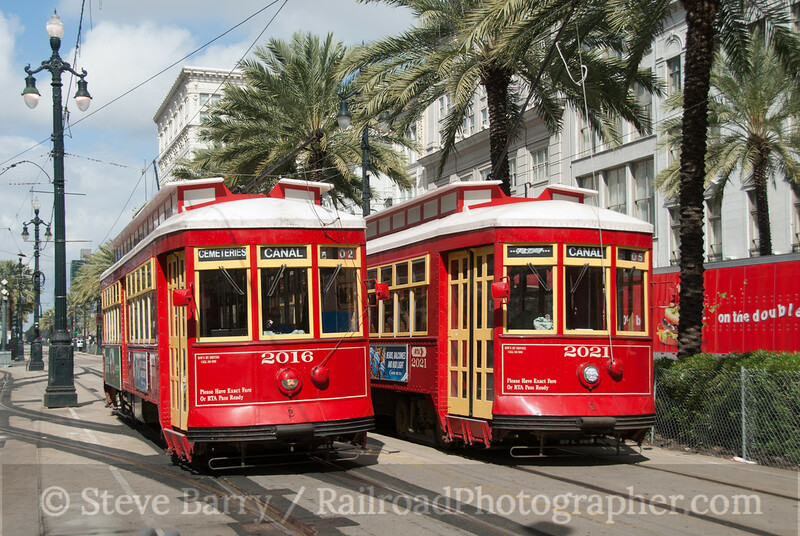 After shooting several cars on St. Charles Avenue we headed back to an area just a few blocks from the French Quarter where the Canal Street cars and St. Charles cars share Canal Street for about a block. This is one busy place with looping St. Charles cars heading briefly south and Canal cars passing. We spent quite a bit of time here trying to get cars from both lines in the same frame, but were largely unsuccessful. Getting two Canal Street cars together was much easier. As the afternoon progressed we kept an eye on the clock. 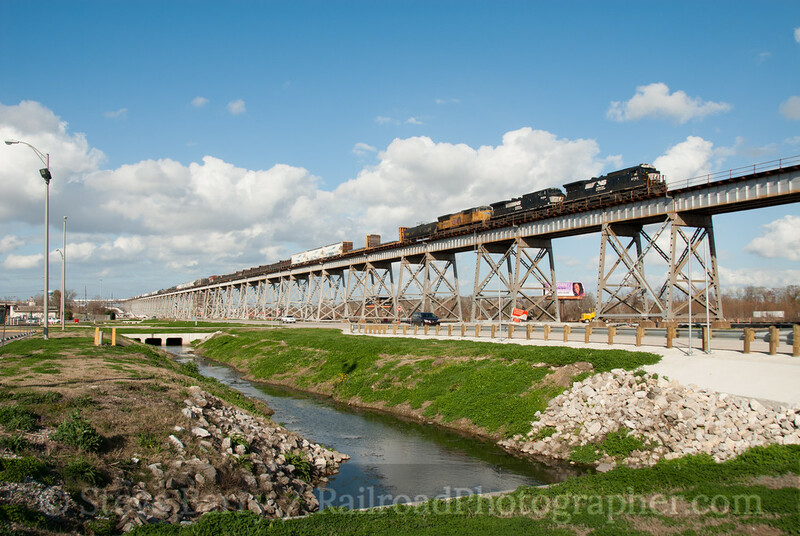 The northbound and southbound City of New Orleans traverse the wooden trestle over the Bonnet Carre spillway within an hour of each other and we wanted to make sure we got them. The northbound was first, which was a tight broadside shot. 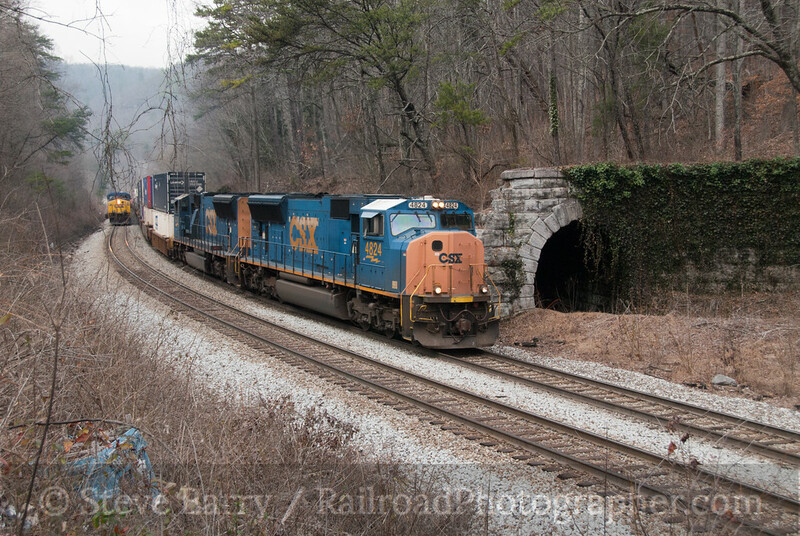 The southbound train, which was a much better shot, had Amtrak locomotive No. 1 leading, but the train and a cloud headed towards us at pretty much the same pace. We did squeeze off the shot, however. Back into the city we finished the day off at NE Tower. Alas, despite bright sun a train never did head west past the tower while we were there. We had to be satisfied with only a shot of the tower with an empty diamond in front. As the sun set, we said farewell to New Orleans. Next up -- Baton Rouge. We'll head north along the Mississippi in our next installment. Am planning to visit the area to the west of New Orleans along the CN (IC) line along Lake Pontchartrain. Is the area easy to access? I want to walk NW toward the lake and get shots of the SB City Of New Orleans. Looking at Google Earth, I also see many trestles over water in the area, which one you photographed, which might also make for some good shots. Am curious your experiences there.